(CBS/AP) OKLAHOMA CITY -- One of the teens charged in the "thrill kill" of an Australian baseball player apparently tweeted about "taken [sic] life's" three days before 22-year-old Christopher Lane's shooting death. PICTURES: Australian baseball player fatally shot in Okla.
James Francis Edwards, Jr. is charged in the murder of Lane, 22, of Melbourne, who was shot once in the back Friday as he was jogging near his girlfriend's family's home in Duncan, Oklahoma. Prosecutors say the 15-year-old Edwards was in the passenger seat of a car driven by Michael Dewayne Jones, 17, when Chancey Allen Luna, 16, shot and killed Lane from the backseat. 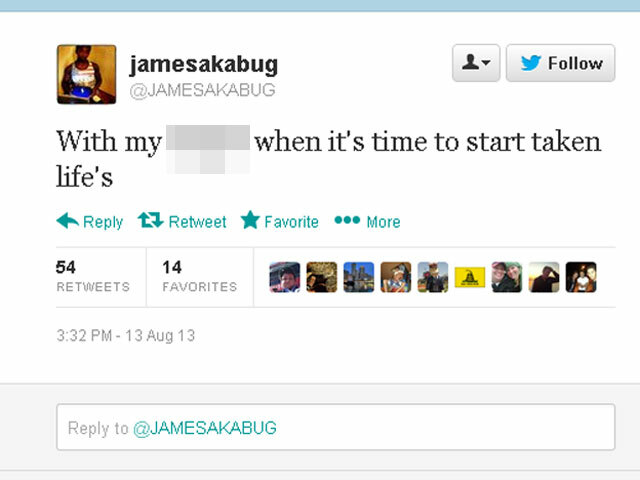 Three days before the Friday shooting, during which police say Lane was shot in the back, Edwards apparently tweeted under the Twitter handle @Jamesakabug, writing, "With my n----- when it's time to start taken (sic) life's." Police said Jones later admitted the boys were "bored" and killed Lane "for fun." Witnesses said Lane fell into a ditch panting with blood on his back before emergency personnel arrived. "They saw Christopher go by, and one of them said: 'There's our target,' Police Chief Dan Ford. "The boy who has talked to us said, 'We were bored and didn't have anything to do, so we decided to kill somebody.'" Edwards also tweeted several times about guns and being a "thug." In June, Edwards tweeted: "Lol she said we fake thugs but she also said we carry guns Ain't that what thugs do not saying I do carry a firearm. Just pointing that out." The tweet was posted several months before the shooting and before a parent of one of the teens charged in the case told CBS affiliate KWTV in Oklahoma City her son and his friends were in a "wannabe gang." It's not clear who Edwards was referring to in the tweet. Edwards is also seen in a video posted on the Vine video-sharing application apparently pointing a rifle. "(Expletive) we up dem poles," Edwards says in the video, pointing the rifle at the camera. "(Expletive) with me." Lane was a student at East Central University in Oklahoma. A native of Melbourne, he hoped to go into real estate when he graduated next May. "He achieved a lot for a 22-year-old," his father, Peter Lane, told reporters in Melbourne. "He gave up a lot to follow his dream." A former coach who recruited Lane from Australia remembered him Wednesday as a well-rounded, charismatic guy who knew he wasn't the best baseball player in the world, but was passionate about the sport, worked hard and used his skills to pursue a college education. "Chris was such a level-headed guy. He knew his limitations," said Matt Newgent, Lane's former coach at Redlands Community College. "He knew in his heart of hearts he wouldn't make the majors," Newgent said. Lane and his girlfriend, Sarah Harper, had recently returned from a trip to Australia, and Lane was visiting Harper and her parents in Duncan, a south-central Oklahoma city of about 24,000, at the time he was shot. Edwards and Luna face life in prison without the possibility of parole if they're convicted. The teens will be tried as adults. Jones, who is considered a youthful offender but will be tried in adult court, faces anywhere from two years to life in prison. In a court hearing Tuesday, prosecutor Jason Hicks called the boys "thugs." "I'm appalled," Hicks said after the hearing. "This is not supposed to happen in this community." Edwards has had prior run-ins with the law and came to court Friday - apparently after the shooting - to sign documents related to his juvenile probation. "I believe this man is a threat to the community and should not be let out," Hicks said as he requested he be held without bail. "He thinks it's all a joke." The two younger boys were held without bail, while bail for Jones was set at $1 million. Before the hearing, Edwards' father, James Edwards Sr., said he knew where his son was 95 percent of the time. He said his son was involved in wrestling and football, and was trying to forge the same sort of athletic career as Lane.